NSPE Senior Manager of Government Relations Sarah Ogden attended a High-Performance Building Congressional Caucus Coalition briefing on "Earthquake Hazards and the Nation's Buildings," where structural engineers discussed the need for stricter earthquake codes and standards in U.S.
NSPE Senior Manager of Government Relations Sarah Ogden represented NSPE at an Industry Summit on Sustainability and Risk, sponsored by the Associated General Contractors and American Institute of Architects. NSPE Senior Manager of Government Relations Sarah Ogden participated in a Coalition for National Science Funding meeting, where National Science Foundation Assistance Director for Geosciences Tim Killeen spoke about the Geosciences Directorate and NSF's programmatic goals for FY12. NSPE Senior Manager of Government Relations Sarah Ogden presented a webinar, "Engineering Public Policy," about how NSPE is making a difference for professional engineers in a challenging political climate embodied by a Congress divided against itself. NSPE Treasurer Leanne Panduren, P.E., F.NSPE, Executive Director Larry Jacobson, and Senior Manager of Government Relations Sarah Ogden met with Congressmen Joe Barton, P.E. NSPE cosponsored the Society of Women Engineers's "Diversity and Inclusion Fuels Innovation in STEM" Capitol Hill Day. The event included a congressional reception, where Representatives Roscoe Bartlett (R-MD-6), Eddie Bernice Johnson (D-TX-30), Dan Lipinski (D-IL-3), and Silvestre Reyes (D-TX-16) spoke about the importance of broadening participation in STEM fields. NSPE Senior Manager of Government Relations Sarah Ogden participated in a Council on the Federal Procurement of Architectural and Engineering Services meeting. NSPE is a founding member of COFPAES, an organization dedicated to protecting and promoting the Brooks Act (PL 92-582) and the use of qualifications-based selection. NSPE President-Elect Christopher M. Stone, P.E., F.NSPE, LEED AP, was the keynote speaker at the Department of Transportation's "Engineers Move America," an event directed toward high-school students that recognizes the role of engineering in the nation's transportation program. In his address, Stone encouraged students to pursue careers in engineering to solve the challenges the world is facing. NSPE Executive Director Larry Jacobson and Senior Manager of Government Relations Sarah Ogden met with senior counsel from the majority side of the Senate Judiciary Committee to discuss the Criminal Justice and Forensic Science Reform Act (S. 132). 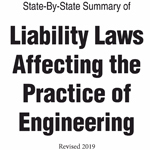 NSPE has completed its member survey regarding Department of Transportation regulations that impede the engineering profession.